The Queensland Department of Natural Resources and Water calls for registrations of interest for general reserve unallocated water available under the ‘Water Resource (Great Artesian basin) Plan 2006‘ According to a public notice in The Courier Mail, (13/09/2007), the Department of Natural Resources and Water (the Department) intended to make available unallocated water held as General reserve water identified in North management areas. 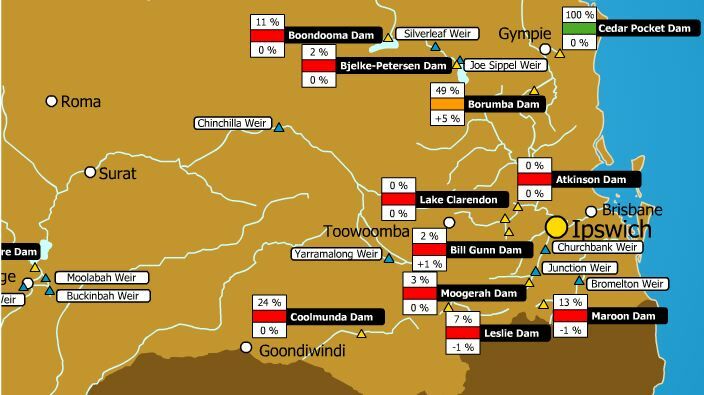 See storage levels in the regions, below. Specifics of area available with department: The water would be available through granting of water licences to take water under the Plan. The exact location of the boundary of the Area was held in digital electronic form by the Department of Natural Resources and Water and may be inspected at the department’s office at 203 Tor Street, Toowoomba. Call for registration of interest: The Department was calling for registrations of interest from those having standing to apply for a water licence under section 206 of the Water Act 2000. Release as per ROP: The water would be released through the process identified in the ‘Great Artesian Basin Resource Operations Plan 2000’ (the ROP). In accordance with the Plan, water may be granted, as far as practicable from the management units. No restrictions on numbers: There was no restriction on the number of water licences that could be attached to a particular parcel of land; therefore existing water licence holders could register interest for a water licence. Approved land and water management plan required: An approved land and water management plan would be required before water could be taken for the purpose of irrigation under the water licence. The application to register would he assessed in accordance with section 15 of the ROP. It stated that some applications could be refused if they did not meet the requirements of the Plan or the ROP. Unallocated water could be available: Following an assessment of application to register, unallocated water could be made available through either a tender or fixed price process as outlined in the ROP. Alternatively, no unallocated water could be made available. • any other relevant matters. Requisites: It was required that interested parties wishing to register an interest for unallocated water were not bound to be part of any subsequent release of unallocated water through either a tender or fixed price process. Mandatory expression of interest: However, to be eligible to apply for unallocated water that could be released through a tender process it was MANDATORY TO REGISTER AN INTEREST FOR GENERAL RESERVE UNALLOCATED WATER. Fees: Applications to register an interest must be submitted in the approved form and must be accompanied by a non-refundable application fee of $168.50 and submitted by 4.30 pm on Friday 12 October 2007. Conflict was emerging over the existence of 500 million tonnes of coal and vast quantities of groundwater on the Liverpool plains, said Independent MP Tony Windsor in the Federal Parliament on 13 August 2007. According to , Peter Kenny, president of land holder lobby-group AgForce, mining operations have abandoned a site and the remediation deposit collected by the Environmental Protection Agency (EPA) has been grossly inadequate, which means the site is effectively left for landholder to clean up. This situation must be rectified and the EPA given the powers and resources to properly manage this situation, he wrote in Queensland Country Life, (6/9/2007), p. 35. Up to $31 billion worth of coal buried under Sydney’s catchment area may never be extracted unless it can be mined without disrupting the city’s future water supply, reported The Australian (15/8/2007, p.7). SCA seeks tougher approval process for mining: While the Sydney Catchment Authority yesterday stopped short of proposing a moratorium on mining, it recommended a tougher approval process. In its submission to an inquiry into the future of underground coal mining on the southern outskirts of Sydney, the authority said limited information was available on the impact of the industry on the water supply. SCA moderates tone for final draft: It is understood earlier drafts of the SCA submission took a harder line on the coal industry, with the tone moderated in the final draft submitted to the inquiry. Miners in the region include BHP Billiton, Centennial Coal and Peabody Energy, with up to five new development applications under the catchment expected to be made in the next year. Environmental damage due to mining: Some underground mining in the southern coalfields has caused significant environmental damage to pristine rivers and creeks in the region. Sections of rivers and creeks have drained into large cracks and subsidence has been caused by operations hundreds of metres underground. Loss of lows: Since 2004, longwall mining under the Waratah Rivulet has resulted in the loss of flows for approximately 2km caused by fracturing of the riverbed and rock bars. In 1998, the Cataract River went dry as a result of cracking of the riverbed. The damage has angered residents and activists. They have called for a moratorium on mining under the catchment and nearby rivers, questioning the viability of the industry. SCA calls for delays, not bans: Submissions to the panel of five experts closed at the end of last month, with public hearings to begin next month. Significantly, the SCA submission to the inquiry did not oppose mining under the Sydney catchment, nor did it suggest the banning of mining under rivers or endorse the need for mandatory buffer zones. However, it said future approvals should be delayed or denied if there was insufficient information on potential impacts requiring either more detailed assessment or changes to mining practices and layouts. SCA chief executive Graeme Head said mining companies and the state Government needed to improve scientific understanding of the impacts and mitigation of underground mining to better protect Sydney’s valuable water supplies.